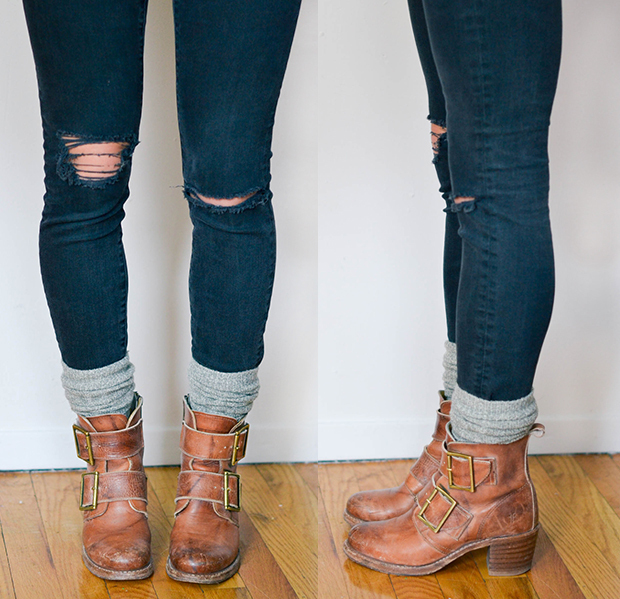 I know what you’re thinking…who knew there were so many ways to wear socks with booties? Well after falling down the rabbit hole of Pinterest, I discovered more ways than you could ever imagine. Some I loved, some were a little weird, so I’m going to show you the three that I think work best. 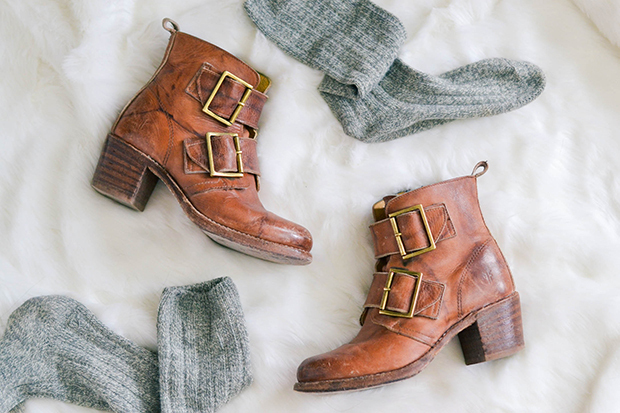 In the winter, cozy socks are a great accessory to a casual, everyday outfit. They don’t just have to be hidden under your clothes for warmth, they can also add some (hipster) edge to your look. You know how when you wear booties with skinny jeans, that bit of skin above your boot is exposed? Well wearing your socks in one of these stylish ways will solve that problem, keeping you warm all winter. I recommend marled gray wool socks – Madewell has the perfect pair (which also comes in tan, black, and navy!). And if you like these boots featured, you can buy them here. Recently I’ve been wearing this look a lot (pretty much on the daily). Just choose a longer pair of socks so you can pull them over your skinny jeans and then bunch them down. Try wearing gray socks with your black or blue jeans, or pair black socks with your black jeans for a sleeker look. If the bunched look is a bit too bold for you, try wearing shorter socks and just letting the top of them peek out of your boots. It’s a less bulkier look that I’d recommend as to not distract from the rest of your outfit. Be sure to tuck your jeans into your socks here as well. A recent favorite of mine is this menswear inspired look. Men always have their socks showing a bit between their shoes and their jeans, so why not try it too? Put your socks on first and pull them up as high as they go. 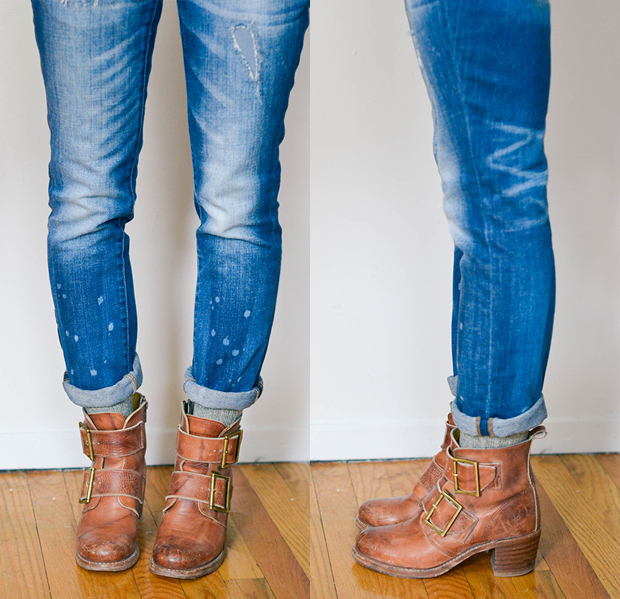 Pull on your jeans after so your socks stay smooth and straight. Make sure the socks are slightly exposed, either by wearing cropped jeans or by rolling your pants a touch. This look is great with skinny jeans or boyfriend jeans. I also love it with loafers instead of booties! 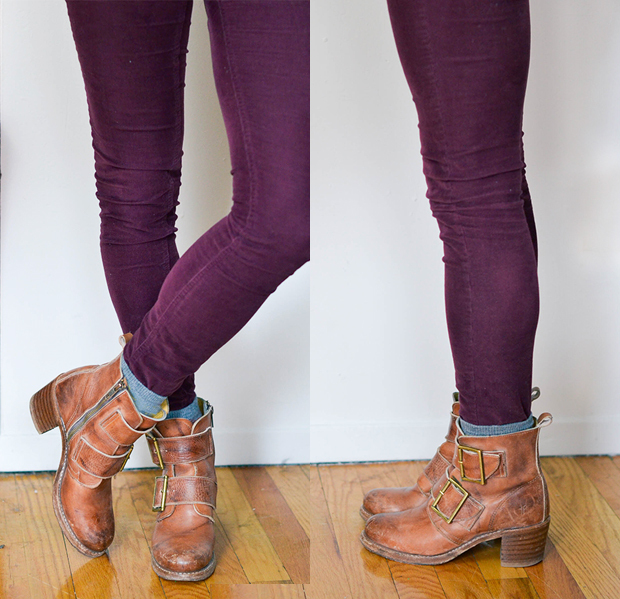 Any questions about pairing your socks with your ankle boots? Ask away below! the socks are great, but can we talk about those booties! too cute! How appropriate that I found your blog last year or two years ago when I came across your post about when to wear ankle boots and when to wear riding/ tall boots, and now another ankle boots post. Loved that first article and since then I’ve been hooked! 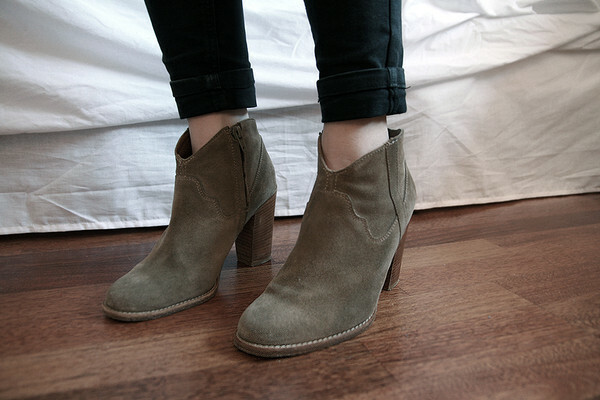 Also mayyyyyy have loved the olive/gray/taupe suede booties that you have from Madewell…and bought myself a similar pair from DSW. Adorable. and I get compliments every time I wear them. I wore some adorable boot socks with lace today. Happy New Year! Pingback: Booties + Socks | The Letter "M"
Thanks for this! How do you feel about bunched socks with ankle boots when wearing dresses with leggings/tights? I tried it this morning but it didn’t look quite right. Hi, Can you please give the brand of those booties? ? Thanks!